To celebrate the occasion, Warner Home Video has announced a count-down to Middle-earth Midnight Madness celebratory event at Best Buy's West Los Angeles location, 11301 W. Pico Blvd., where fans can join in the anticipation of the magic moment when they'll finally be able to own the new extended edition trilogy on Blu-ray. Special Event Featuring Cast Member Greetings, Costume Contest With Fabulous Prize Packages, and More. One Ring. One Release. One Unforgettable Night. Special Event Featuring Cast Member Greetings, Costume Contest With Fabulous Prize Packages, and More at Best Buy in West Los Angeles to Celebrate Warner Home Video's June 28 Midnight Release. Facebook Page, with 5.2 Million Friends, is Official Destination for Insider Information, "Wisdom Wednesday" Q&A with Weta Workshop Talent and new Elvish Name Translator application! Burbank, Calif., June 17, 2011 -- On June 28, Warner Home Video will release all three of Peter Jackson's visual masterpieces on Blu-ray in a 15-disc stunning collection entitled The Lord of the Rings: The Motion Picture Trilogy (Extended Edition) . To celebrate the occasion, Warner Home Video has announced a count-down to "Middle-earth Midnight Madness" celebratory event at Best Buy's West Los Angeles location, 11301 W. Pico Blvd., where fans can join in the anticipation of the magic moment when they'll finally be able to own the new extended edition trilogy on Blu-ray. Brimming with enthusiasm, fans from all over the country (and possibly worldwide) will be encouraged to arrive for the festivities at 12:00 PM on June 27 -- dressed as their favorite Middle-earth characters. The Aragorn, Frodo, Gandalf and other look-alikes will be eligible to win one of several exciting prizes, with one lucky contestant capturing the Grand Prize of a VIP "Tour of Middle-earth" – an all-expense-paid trip to New Zealand (Auckland, Wellington, Queenstown), courtesy of Air New Zealand and Weta Workshop. Highlights of the Grand Prize package itinerary will include a VIP tour hosted by Hobbiton Movie Set Tours, visits to The Lord of the Rings movie locations, a SKYCITY Grand Hotel VIP experience in Auckland and being hosted at the Weta Cave by the crew from Weta Workshop. Two Second Prize winners will receive an Official 10k Solid Gold version of The One Ring from Noble Collections (consumer value $495 each). Three Third Prize winners will receive a life-sized replica of The Sting Sword, Frodo's sword used throughout the Trilogy, also supplied by Noble Collections (consumer value $295). All attendees will be winners, as they marvel at the specially created atmosphere, with autographs from celebrities, and themed give-aways, topped off with the choreographed countdown to midnight and the satisfaction of being the first people in the world to get their new Blu-ray copy of The Lord of the Rings The Motion Picture Trilogy: Extended Edition. In attendance will be talent from the trilogy as well as broadcast, print, radio and online media to report on all activities, including the fan-favored online destination TheOneRing.net. TheOneRing.net staff will be on hand, as the line starts officially at 12:00 PM on June 27th, to celebrate the release with trivia, games, fan profiles and more! Smaller prizes and swag will be handed out throughout the day. Costumes will be judged by representatives from TheOneRing.net as well as by Richard Taylor who will judge the finalists via Skype. Taylor, co-owner and creative lead at Weta Workshop is co-founder of the Weta companies in New Zealand. Weta Workshop has an international reputation as one of the film industry's most successful special effects studios. Richard and the team worked on The Lord of the Rings film trilogy for seven years designing and creating armour, weapons, prosthetics and miniatures for these films, and Richard received four Oscars® and three BAFTAs for Weta's work on the trilogy in the disciplines of Costume; Make up and Visual Effects. The Lord of the Rings Facebook page, with 5.2 million fans, is the official destination for insider information, talent access, and new content. The all new Elvish Name Translator application, allowing fans to explore the history of the Elvish language and translate their name into the official Elven font, launched on the page on June 6th. Additionally, June 8th marked the beginning of "Wisdom Wednesdays," a Q&A format where fans get to hear from the legendary talent behind the trilogy. Alan Lee and John Howe, illustrators and conceptual artists for The Lord of the Rings film trilogy as well as Academy Award® winning talent Richard Taylor, Design and Effects Supervisor for The Lord of the Rings film trilogy will respond to fan questions, previously gathered through the Facebook destination. Answers began posting on June 8th with future video postings on June 15th and 22nd. TNT scheduled airings of the theatrical versions include The Lord of the Rings: The Return of the King Saturday June 18th at 8:00pm ET/11:00pm PT followed by the July 3rd airings of The Lord of the Rings: The Two Towers at 1:00pm ET/4:00pm PT and an encore of The Lord of the Rings: The Return of the King at 4:45pm ET/7:45pm PT. Additionally, on June 30th, CBS's hit network comedy series, "The Big Bang Theory," is scheduled to show, both on air and via cbs.com, a re-broadcast of their highly-rated The Lord of the Rings parody episode, "The Precious Fragmentation." Exclusive in-theater screenings of the trilogy in high definition are taking place on three consecutive Tuesdays this month, each in 500 theaters across the country. Presented by NCM Fathom and Warner Home Video as The Lord of the Rings The Motion Picture Trilogy Extended Edition Event, the screenings will be as follows: The Lord of the Rings: The Fellowship of the Ring on June 14; The Lord of the Rings: The Two Towers on June 21; and The Lord of the Rings: The Return of the King on June 28, all at 7:00 p.m. local time. During each event, theater audiences will also view, on the big screen and in hi-def, nearly an hour of additional feature footage per film with extended scenes carefully selected under the supervision of director Peter Jackson. In addition, fans will be treated to personal introductions to each film in the trilogy from Jackson. Coming soon is the new videogame The Lord of the Rings: War in the North! In this co-op based Action RPG, you must work together or die alone in an epic quest to turn the tides in the War of the Ring. Fight new enemies, visit new lands, and live the untold adventure. Available on Xbox 360®, PlayStation®3, and Games for Windows®. Fans can pre-order the game at www.bestbuy.com or any Best Buy store. 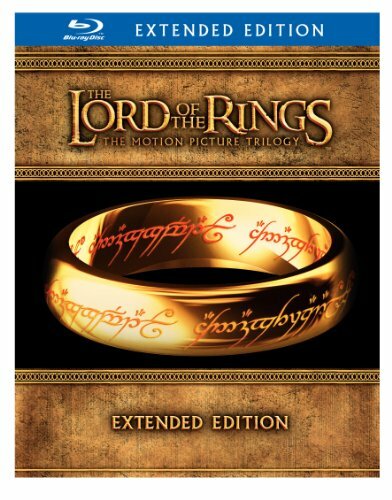 This highly anticipated extended edition (Blu-ray) set will be released in English 6.1 DTS-HD MA audio and includes a new transfer of The Lord of the Rings: The Fellowship of the Ring which was remastered from the original 2k digital files. The set boasts more than 26 hours of additional content, highlighted by the rare behind-the-scenes documentaries created by Costa Botes, the filmmaker given unprecedented access to the set of each production by Peter Jackson. The feature-length documentaries, with more than four and a half hours of footage, focus on a number of complexities and circumstances that tested the filmmakers, cast and crew during the shoot, as well as a look at some of the comical antics and personal moments on the set. The Costa Botes documentaries accompany acclaimed special features by Michael Pellerin from the original extended cut releases to make this the most comprehensive The Lord of the Rings compilation ever. The Lord of the Rings: The Motion Picture Trilogy (Extended Edition + Digital Copy) Blu-ray will be packaged in multi-disc elite packaging inside a premium rigid slipcase and will retail for $119.98 SRP. Warner Home Video Blu-ray Discs offer resolution six times higher than standard definition DVDs, as well as extraordinarily vibrant contrast and color and beautifully crisp sound. The format also provides a higher level of interactivity, with instant access to extra features via a seamless menu bar where viewers can enjoy features without leaving or interrupting the film. © 2011 New Line Productions, Inc. All rights reserved. The Lord of the Rings: The Two Towers and the names of the characters, items, events and places therein are trademarks of The Saul Zaentz Company d/b/a Middle-earth Enterprises under license to New Line Productions, Inc.
TNT, one of cable's top-rated networks, is television's destination for drama. Seen in 100.5 million households, the network is home to such original series as The Closer, starring Emmy® winner Kyra Sedgwick; Rizzoli & Isles, starring Angie Harmon and Sasha Alexander; 2011 Peabody Award winner Men of a Certain Age, with Ray Romano, Scott Bakula and Andre Braugher; Leverage, starring Timothy Hutton; Hawthorne, with Jada Pinkett Smith; Memphis Beat, with Jason Lee; and Southland, from Emmy-winning producer John Wells (ER); as well as new series Falling Skies, starring Noah Wyle, and Franklin & Bash, with Mark-Paul Gosselaar and Breckin Meyer. TNT also presents such powerful dramas as Bones, The Mentalist, Supernatural, Las Vegas, Law & Order, CSI: NY, Cold Case and, starting next year, Castle; broadcast premiere movies; compelling primetime specials, such as the Screen Actors Guild Awards®; and championship sports coverage, including NASCAR, the NBA and the NCAA Division I Men's Basketball Championship. TNT is available in high-definition. Best Buy Co., Inc. (NYSE: BBY) is a leading multi-channel global retailer and developer of technology products and services. Every day our employees - 180,000 strong - are committed to helping deliver the technology solutions that enable easy access to people, knowledge, ideas and fun. We are keenly aware of our role and impact on the world, and we are committed to developing and implementing business strategies that bring sustainable technology solutions to our consumers and communities. For information about Best Buy, visit www.bby.com. NCM operates NCM Media Networks, a leading integrated media company reaching U.S. consumers in movie theaters, online and through mobile technology. The NCM Cinema Network and NCM Fathom present cinema advertising and events across the nation's largest digital in-theater network, comprised of theaters owned by AMC Entertainment Inc., Cinemark Holdings, Inc. (NYSE: CNK), Regal Entertainment Group (NYSE: RGC) and other leading regional theater circuits. NCM's theater advertising network covers 170 Designated Market Areas® (49 of the top 50) and includes approximately 17,300 screens (16,000 digital). During 2010, over 675 million patrons attended movies shown in theaters currently included in NCM's network (including Consolidated Theatres, Rave Cinemas and R/C Theatres). The NCM Fathom Events broadcast network is comprised of over 600 locations in 162 Designated Market Areas® (all of the top 50). The NCM Interactive Network offers 360-degree integrated marketing opportunities in combination with cinema, encompassing 43 entertainment-related websites, online widgets and mobile applications. National CineMedia, Inc. (NASDAQ: NCMI) owns a 48.5% interest in and is the managing member of National CineMedia LLC. For more information, visit www.nationalcinemedia.com or www.ncm.com or www.fathomevents.com. (NCMI-F). Founded in 1999 by a group of like-minded Tolkien fans so anxious for the coming Peter Jackson The Lord of the Rings films that they were gathering up every scrap of production information to be found, TheOneRing.net continues today in bringing fans the latest news on the beloved figures involved in the making of the wildly popular The Lord of the Rings movies as well as the newest information available on The Hobbit, Tolkien-centered events, new publications, and fan gatherings. As a not for profit entity, the site is maintained by an international staff of over 20 volunteers and regularly donates site profits to charitable organizations worldwide. The site lives by the motto: Forged by and for fans of J.R.R. Tolkien. It can be found online at http://www.theonering.net and on facebook.com/theoneringnet. The Hobbiton Movie Set & Farm Tour is an essential stop on the itinerary of all visitors travelling through New Zealand, offering an interesting and entertaining experience incorporating the famous film set and a special insight into rural life. The Shires Rest Cafe is situated at the entrance to the set and provides an ideal place to stop for refreshments or that "Second Breakfast"! Experience the real Middle-earth with a visit to the Hobbiton Movie Set, the bucolic setting for The Shire that featured in the Peter Jackson directed films, The Lord of the Rings. Your tour starts with a drive through the picturesque 1,250 acre sheep farm with spectacular views across to the Kaimai Ranges before being escorted through the ten acre site where you guide will recount fascinating details of how the Hobbiton set was created. You will see how this beautiful piece of Waikato farmland was transformed into The Shire from Middle-earth. The Noble Collection is a privately held company that was founded in 1991. The Noble Collection specializes in movie reproductions and collectibles. The Noble Collection is known for making innovative products of exquisite design and fine craftsmanship. Product categories include prop replicas, jewelry, chess sets, sculptures and other movie collectibles. The Noble Collection prides itself on its creative force and dedicated talent. Air New Zealand offers more direct flights to the South Pacific than any other airline, including non-stop flights from San Francisco, Los Angeles, Honolulu and Vancouver to New Zealand. In addition to flying non-stop Los Angeles-London, Air New Zealand's route between London and Hong Kong now allows customers to fly round-the-world on one airline. Air New Zealand's most recent accolades include "Best Business Class to Australia, New Zealand and South Pacific" for the third straight year by Business Traveler Magazine (USA) "Best Transpacific Airline" at the 26th Airline Industry Awards and "Best Passenger Service" award by Air Transport World magazine. Flight and vacation essentials can be booked on AirNewZealand.com or by calling 1-800-262-1234 in the USA and 1-800-663-5494 in Canada. Air New Zealand is a member of the Star Alliance network. NO PURCHASE NECESSARY. Open to legal U.S. residents. A parent or legal guardian must accompany any participant under 18 years of age at all times during the event. For official Registration Form and complete Official Rules including costume guidelines and prize descriptions, visit www.lordofthering.net. * Academy Awards® and Oscar® are both registered trademarks and service marks of the Academy of Motion Picture Arts and Sciences.